Pichu Bros. can't attack if you have less Benched Pokémon than your opponent, or if you have no Pokémon in your Bench. Flip 2 coins. If both are heads, this attack does 60 damage instead of 30. If only one coin is head, the Defending Pokémon is now Paralyzed. 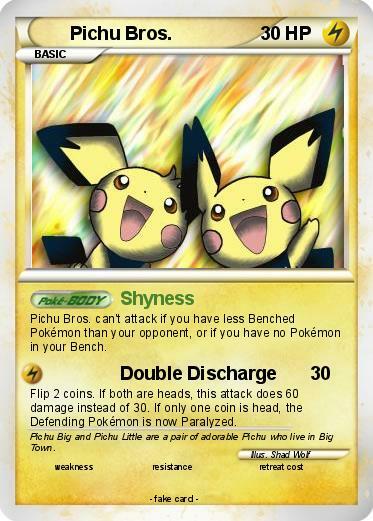 Comments : Pichu Big and Pichu Little are a pair of adorable Pichu who live in Big Town.